Yep, the city is getting in our pocket books. EPISD has been holding the line and I thank them. Next year, however, will be another story. They will have to raise their interest and sinking funds rate to make up for the 10 cents the voters gave them in the penny swap election. The chart shows the increases. What it fails to point out is that half of your property tax bill goes to the district. This entry was posted on Friday, February 15th, 2019 at 5:00 AM and is filed under City government, County Government, El Paso Independent School District. You can follow any responses to this entry through the RSS 2.0 feed. You can leave a response, or trackback from your own site. My bill is worse. I live in SISD. The way I see it is that there should be a fixed “rate”. I mean FOREVER. If there is a truly increased “need”, it should be handled by property volume increases alone. The incease in costs due to inflation should automatically be handled by the increase in property values alone. SIMPLE MATH, I THINK. Trump is correct on that one. Fewer students in the district with declining enrollment should mean the cost to educate all those children is also going down. If we once had 62,000 students that needed an education, now we only have 55,000 – it ought to cost less to educate 55K than 62K students. Not the per student cost, but the over all cost. Right? Why has Cabrera grown central office when he ought to have been shrinking it over the last few years? He’s trying to shrink the number of schools; doesn’t he see the need to trim his own realm? This guy is a hollow suit – he talks big but hasn’t accomplished anything but the demise of EPISD. He’s finishing what Garcia started. People in El Taxo have to look at their pay checks, “Budgets”. Husbands, wives, FAMILIES have to decide, “How do WE pay these higher taxes? How do WE do MORE with LESS (money)? Well Cabrera and his EPISD Board never have that problem. HE gets an exorbitant, outrageous pay check from US. What is it that HE does, he deserves that much from US? WE, El Taxo could use all that wasted money to put POLICE on the streets.. Cabrera’s, School Boards only “Problem” is “How do WE do LESS with MORE money”?? And what happens when OUR Property “Values” are increased, INFLATED, so that taxes can be increased?? Give EPISD, Cabrera MORE money. And still in El Taxo, “Johnny, Suzie cannot read, write, speak English or do Math” ?? WHY? So apparently the “Penny swap” deal was just another EPISD scam, a con job? Why do VOTERS keep believing whatever EPISD, Cabrera, crooks tell them? Just lies, deception to put more of OUR money in Cabrera’s pockets or to WASTE money on STUFF they don’t need. Inherent corruption, just like Lorenzo Garcia, Just like the Mayor, the rest of the City of El Taxo. 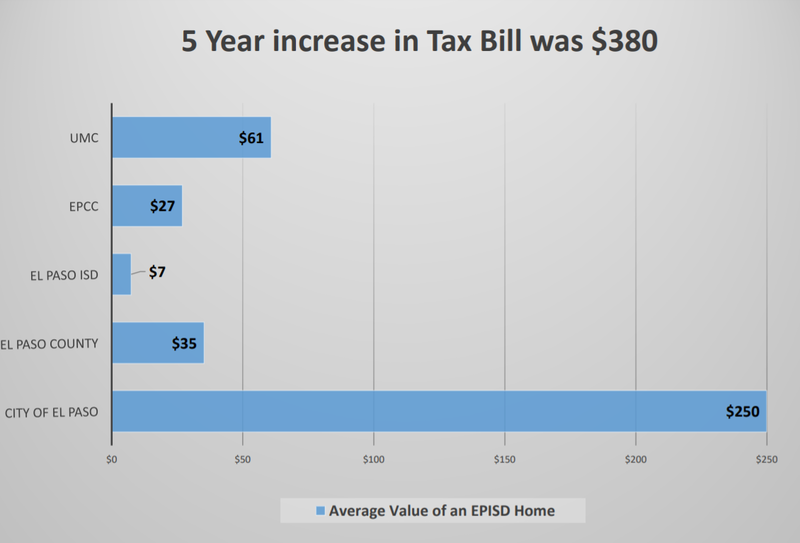 No, half of my property tax bill does *not* go to EPISD. What y’all keep forgetting is that not everybody who live in El Paso lives in that one district!